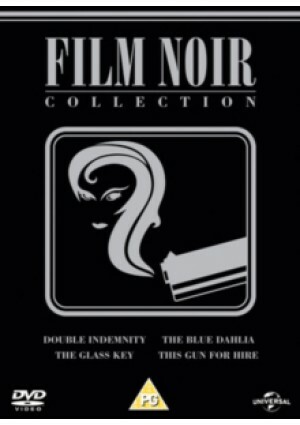 Collection of four classic crime films. In 'This Gun for Hire' (1942) a hitman called Raven (Alan Ladd) is double-crossed by nightclub owner Willard Gates (Laird Cregar), a middleman for traitorous industrialist Alvin Brewster (Tully Marshall). Traveling to Los Angeles to kill his way to the top of his betrayers, Raven meets up with Ellen Graham (Veronica Lake), a nightclub magician and singer who has been enlisted by a senator to use Gates to find out who is making deals to manufacture poison gas for the Japanese.Meanwhile, Ellen's fiancée Detective Michael Crane (Robert Preston) tries as best he can to keep up, tracking Raven while wondering if his girlfriend has been kidnapped or is a willing accomplice. Double Indemnity (1944), classic adaptation of James M. Cain's hardboiled noir novel by director Billy Wilder and writer Raymond Chandler. Insurance salesman Walter Neff (Fred MacMurray) calls at the house of femme fatale Phyllis Dietrichson (Barbara Stanwyck) in order to renew her husband's insurance policy. An immediate attraction sparks between the two, and gradually Phyllis seduces Walter into conspiring with her to murder her husband, now provided with a double indemnity insurance clause. The murder is carried out as planned, but the couple then find themselves growing increasingly suspicious of each other as they get closer to collecting the money. When Walter's boss, relentless investigator Barton Keyes (Edward G. Robinson), starts to look into the policy, Walter and Phyllis' steely resolve begins to falter. In 'The Glass Key' (1942) despite building his empire by turning a blind eye and granting favours to low-class criminals, crooked politician Paul Madvig (Brian Donlevy) decides to clean up his act and back the anti-mob reform candidate Ralph Henry (Moroni Olsen) in the upcoming governor's elections. However, when notorious gangster Nick Varna (Joseph Calleia) learns of the change of heart, he murders Henry's debt-ridden son Taylor (Richard Denning), and attempts to pin the crime on Madvig. With news of the murder about to break, it's left to Madvig's hired muscle Ed Beaumont (Ladd) to prove his boss is innocent before it's too late. Finally, in 'The Blue Dahlia' (1946), when demobbed serviceman Johnny Morrison (Ladd) comes home to Hollywood from the war, he discovers his wife Helen (Doris Dowling) has been having an affair with local nightclub owner Eddie Harwood (Howard Da Silva). After also learning his young son has been killed in a car accident caused by Helen's drink-driving, Johnny pulls a gun on his wife before storming out. The next morning, upon hearing that Helen has been murdered and that he is the prime suspect, Johnny recruits Eddie's wife Joyce (Lake) and two old army buddies to help him find the real killer and clear his name.